Looking for something a little more whacky? Why not climb into one of our giant Zorb balls (3m in diameter) and roll yourself into a hair-raising adventure. Our Zorbs are super-bouncy – all you do is jump and the ball will move. Want to go faster…just jump faster! It’s easy and loads of fun for the whole family. Why not supersize the fun by hiring our brilliant Zorb Racetrack, you can race and roll against each other around the whole track – it’s like bumpercars with balls! 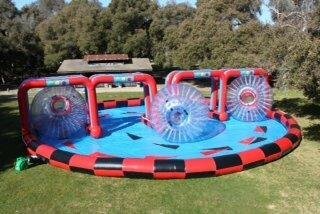 May the best Zorber win! Of course, this family-sized adventure will be fully supervised by one of our friendly, trained staff. All you need to do is have a ball – literally!